Michael Ploch wrote a personal account of participating in last Saturday's road race in downtown Tampa. It's official: The U.S. DOT declares every transportation agency needs to integrate walking and bicycling into their transportation systems. The policy -- "The DOT policy is to incorporate safe and convenient walking and bicycling facilities into transportation projects. Every transportation agency, including DOT, has the responsibility to improve conditions and opportunities for walking and bicycling and to integrate walking and bicycling into their transportation systems. Because of the numerous individual and community benefits that walking and bicycling provide — including health, safety, environmental, transportation, and quality of life — transportation agencies are encouraged to go beyond minimum standards to provide safe and convenient facilities for these modes." Tampa, that means not doing bike lanes like this on Cross Creek Blvd. It's a special day when that pro-bicycle city, St. Petersburg, closes its downtown streets so that Indy, open-wheel cars can zip around the business district while the city that's supposedly a bit behind the bicycle times, Tampa, closes its downtown so that bicyclists can race on the pavement. But it was Tampa that ruled the bicycle world in Tampa Bay today, as the Tampa Twilight Criterium offered a full day of high-speed bike races by rockhard cyclists whose bikes probably cost more than many used cars. The Tampa Downtown Partnership's Karen Kress did a great job at pulling together the day of downtown bike racing. It featured a fun 1:20 p.m. family ride led by the mayor herself and the day of racing included a green expo called ECO.lution pulled off by the Urban Charrette urban planning organization. I was at the Crit representing SWFBUD, which is holding our Bicycle Bash festival on NOV 7 in Flatwoods Park off Morris Bridge Road in Hillsborough County. It was wonderful to see all my local bicycle pals, from Jack "Ghost Rider" Sweeney to bicycle photographer Mary Stewart Latta to bicycle planner Michael Moule to Ellen Pierson of the Police Unity Tour to Jim Shirk, Tampa's all-around bicycle volunteer. Nice to see my buddies from the Seminole Heights Bicycle Club, plus Tim Butts and Wendy Menne of the St. Pete Bike Club. On the scene were also SWFBUD store owners Brian Eckman, David Luppino, Geoff Lanier and SWFBUD member Tom Singletary, who doled out free legal and insurance advice at the SWFBUD tent. Sure, there were more than 400 urban street racers flying through Tampa's downtown at breakneck speeds during the variety of races through the streets of Tampa. But there were also a colorful array of other bicyclists. Bike crashes hurt no matter what your age. Even The Big Wheel was on the course. With Mayor Pam leading the Family Ride, it was time for my every-two-years photo with Pam. The Ghost Riders team was in town. Does Tampa's famed Ghost Rider, Jack Sweeney, know about this? Lawyer Tom Singletary gets animated while chatting legal issues this afternoon. Bridget's green Electra was the envy of the bicycle crowd. There's Karen Kress and two of her three sons during the Family Ride. Michael Ploch of Caleb's Creations, Inc. stopped by to say hey. As for the action, it's breathtaking speeds on the streets of Tampa. 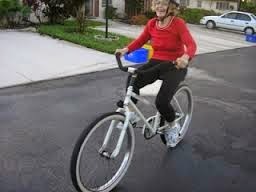 Here's an idea I'd like to pass along to our two-wheeled motorized cousins. If you're a motorcyclist, please stay out of the bike lane. And you might want to wear a helmet, too. Just like us two-wheel riders whose engine is our legs. This weekend is a bicycle blockbuster in Tampa. Stop by the SWFBUD table at the Tampa Downtown Crit and say hi on Saturday. I'll be at the downtown park starting at 11 am. Tampa lawyer Tom Singletary of SWFBUD will be at the SWFBUD table from 1-3 PM at the Crit to answer legal and insurance questions. And on Sunday, the Strawberry Century Ride is being held by the Tampa Bay Freewheelers. SWFBUD tonight announced officially that we're moving the Bicycle Bash Classic, presented by Cure on Wheels to Flatwoods Park in Hillsborough County to be held NOV 7 from 10 am to 4 pm. SWFBUD tonight recognized the work of Hillsborough County Commissioner Mark Sharpe, who reached out to SWFBUD to find out ways to improving bicycling and suggested moving the Bicycle Bash to Hillsborough County.. We then discussed moving the bicycle festival to Flatwoods Park, where we can have live bicycling in the park to go with our popular vendor/exhibitor village. We gathered tonight at SWFBUD store Carrollwood Bicycle Emporium, where owner Brian Eckman hosted a nice announcment. Thank you Brian. Thanks also to Jack Sweeney, the famed Ghost Rider of Tampa, for attending with son Gray and snapping off these photos. 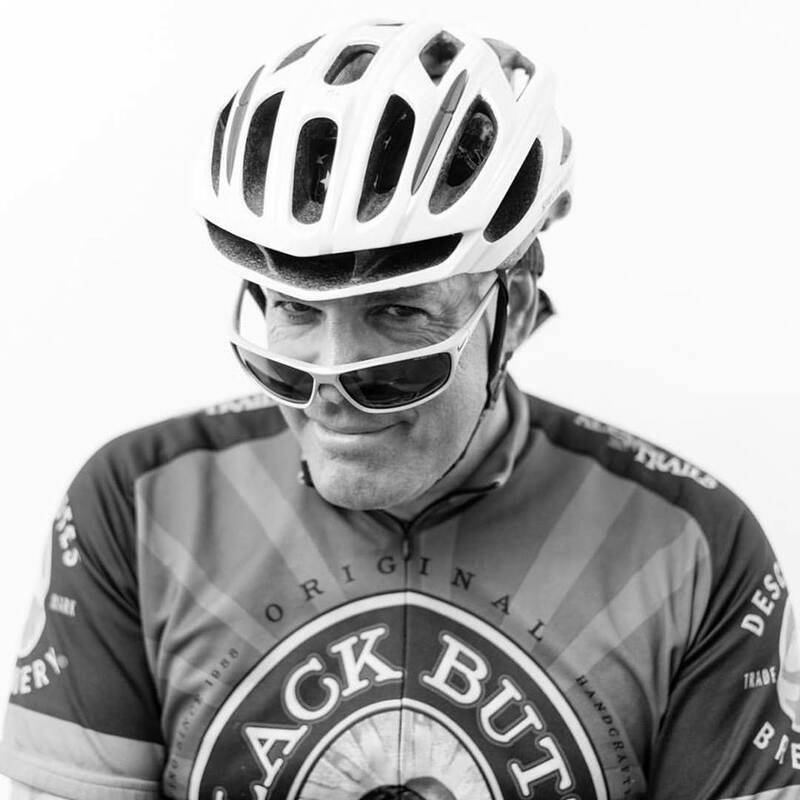 Jack does a great job writing for bikecommuters.com. Here's Commissioner Sharpe telling his commitment to improving bicycling. Next up was Tina Russo, a bicycle leader from Hillsborough parks who explained the importance of cycling in the county. Tina oversees the Upper Tampa Bay Trail. I enjoyed telling the folks tonight that SWFBUD is committed to growing bicycling in the Tampa Bay area. I'll be manning the SWFBUD table at Saturday's Tampa Downtown Crit -- feel free to stop by and say hi. Bicyclist Brad Mercel, who was cited by a Tampa police officer for impeding traffic last November, called me this morning to say he lost his case in court today. Brad argued that because his road lane was "sub-standard" in width -- that is, less than 14 feet wide -- he had a legal right to be in the middle of the lane because the lane is too narrow for a bicycle and another vehicle to travel safely side by side. That is one of four legal reasons that allow a bicyclist to be in the road. The police officer testified, according to Brad, that if 14 feet is sub-standard, then all Tampa's roads are sub-standard. The officer also testified, according to Brad, that a bicyclist could have biked on the sidewalk at the location where Brad was cited. It's tough to fight a legal and police system that thinks sidewalks are the correct place for bicyclists. Brad argued his case before the judge without a lawyer. 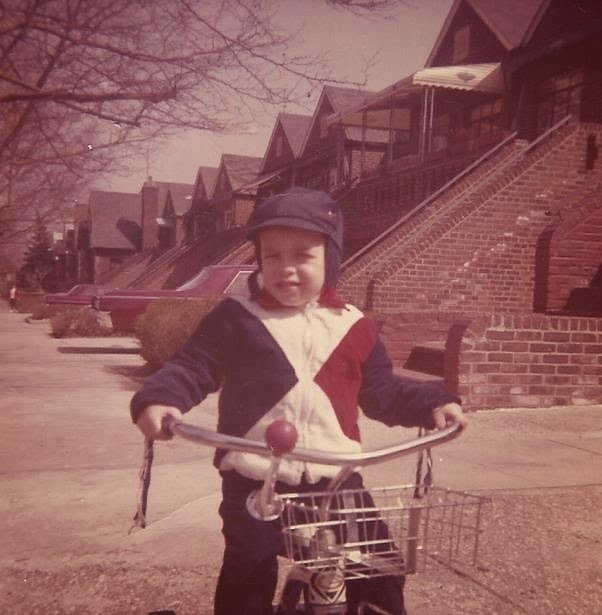 If you are a bicyclist and you are cited, my suggestion is to consider enlisting a lawyer. 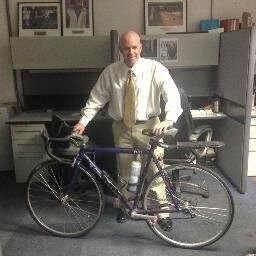 In another bicyclist citation case -- this time in Pasco County -- Tom Jackson of the Tampa Tribune's Pasco County office made the same cliche jokes about bicyclists in bike shorts and slammed cyclists in his column. Thank goodness, Tom and friend of Bicycle Stories, Bret, are protecting the interests of drivers. Hardly a day goes by in Florida where some bicyclist or pedestrian doesn't slam into a car and kills the driver. 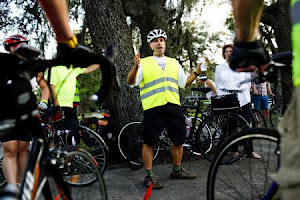 Come to Tallahassee for the 2nd Annual Florida Bike Summit at the Florida Capitol Courtyard April 8, 2010, 10:00 am-2:00 pm, and help protect the rights of bicyclists to ride safely and freely. Our first Summit in 2009 focused on educating legislators about the benefits of bicycling. For 2010, we need your input to define what cycling really is and how it can change Florida one rider at a time. Join us to take advantage of these changing times where more people are riding bikes. The time is now to show how powerful and influential we can be as a unified voice. For more details and to register, visit http://www.floridabicycle.org/joinus/summit.html. "The Dollars and Sense of Bicycling and Walking"
The Tampa Tribune's Laura Kinsler did a story about the tensions and conflicts between motorists and group cyclists in the country roads of Pasco County in the San Ann area. Check out all the kill-the-bicyclist comments following the story. There's a lot hostile sabre-rattling about driving over bicyclists -- reminiscent of the foolish quips uttered over the radio by sports talking head Tony Kornheiser earlier this month. Should bicyclists obey traffic laws like motorists? Absolutely. Motor vehicle operator: Miffed about waiting to pass a bicyclist, will be a few minutes late. Bicyclist: Miffed about the threat of being killed by a driver. Let's all cooperate and be courteous out there. I enjoyed experiencing another side of the local Tampa Bay bicycle scene last night as the Seminole Heights Bicycle Club hosted Ride-in Movie Night. About 20 folks of all ages came on bikes of all shapes and forms (they all had lights for the ride home). We set up the outdoor movie screen in the back yard, arranged the chairs and watched The Flying Scotsman, a movie about a Scotsman who created an aerodynamic bicycle thanks to washing machine parts and who used a "Superman" riding position to become an indoor track world champion while also suffering from depression in the mid-1990. Dale was one of several who came to Movie Night via bicycle with drink and food aboard as well. As you can tell, Dale's next job is beer model. Hmmm, what tasty dish will Jack "The Ghostrider" Sweeney bring for Saturday night's potluck movie night? And there it is -- Chili brought via two wheels, of course. What an impressive array of bikes. Stay tuned for our next movie night under the stars. Don't forget -- Tonight is Seminole Heights Bicycle Club's Bike-in Movie Night. Enjoy a bicycle-theme movie under the stars on the big screen. 8PM: Feature presentation of The Flying Scotsman. Sports talking head Tony Kornheiser, who poked the bear by saying drivers should run over bicyclists on his radio sports show last night, apologized today to Lance Armstrong and Kornheiser and Armstrong have made nice. A bicyclist who was struck by a car in Pinellas County has non-life threatening onjures and the driver is charged with DUI. I urge everyone to continue speaking out to your local governments about getting more public resources for bicycling. In Tampa, SWFBUD's lobbying for more bike lanes in the city during the past year has apparently helped as the city of Tampa plans to put bike lanes on a 2.2-mile stretch of Euclid Avenue in south Tampa. Tampa always gets ranked near the bottom of U.S. cities regarding bicycle-friendliness and I commend the city's transportation staff for addressing this issue by putting in the bike lanes. Another bicyclist tragedy in Tampa Bay area. This time, a cyclist is dead at US 301 and Fowler Avenue in Hillsborough County. It's a hit-and-run. The bicyclist was pedaling against traffic, the story says. I know most of you reading this know the rules and know it's wrong to bike against traffic. I literally bike into these against-traffic bicyclists all the time around here. Stop and politely advise these folks that they are increasing the chances of being hit by a car or truck by biking against traffic. It was typical talk-radio, attention-grabbing stuff. Say something outrageous and nasty with a healthy dose of exaggeration. Tony Kornheiser, a sports guy out of Washington, D.C. who appears on ESPN Radio 980 in DC and also on an ESPN sports show called Pardon The Interruption, didn't like the idea of a bike lane going down the middle of Pennsylvania Avenue from the White House to the Capitol. Kornheiser also doesn't like bicyclists in the road. So, on his March 11 ESPN radio show, he said the same kind of inflammatory why-are-bicyclists-in-the-road stuff you hear all around here -- and "run 'em down" was Kornheiser's most idiotic quote. You can read all the Kornheiser comments here. It reminded me of when David Luppino, owner of Just Ride Bicycles, and I contacted local Tampa radio station WFLA, 970-AM a few years ago after a WFLA radio show host made similar nasty comments about bicyclists. David and I were later invited on the show to talk bicycling and the radio station diplomatically cleaned up the mess. 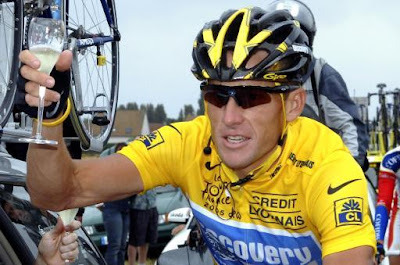 This time, it will be Lance Armstrong, who said Thursday he'll be on the sports talking head's radio show to take on Kornheiser today. It looks like it's the end of the road for the Friendship Trail Bridge. The Friendship TrailBridge, a terrific bridge used by 600,000 annual users including thousands of Tampa Bay bicyclists, has been closed since Nov. 2008 because of structural problems. The Friendship TrailBridge opened on Dec. 11, 1999, linking Tampa and St. Petersburg. This afternoon, I attended a meeting of the Hillsborough-Pinellas Friendship TrailBridge Oversight Committee, the government panel made up of Hillsborough and Pinellas county commissioners and citizens. I appeared before both the Hillsborough and Pinellas County Commissions on behalf of SWFBUD to lobby both counties to seek federal aid to pay for an estimated $15 million to repairs to the TrailBridge to extend the life by 10 years. I also spoke out at two big public hearings in both counties last summer. This afternoon at the committee meeting, an engineering report showed that the repair work has skyrocketed to $42 million from $15 million -- a new twist that prompted the committee to recommend to their respective county commissions to demolish the TrailBridge. This sets into motion a government process that will mean the end of the TrailBridge. Cost to demolish: $13 million. The woman in pink in the wheelchair made a final plea to the committee to keep the trailbridge, which she said she used to get outside and fish. Experienced bicyclists still cross the current Gandy Bridge on its wide shoulders. But many casual bicyclists who don't feel comfortable on the Gandy Bridge shoulders with traffic going 60mph plus don't use the bridge. SWFBUD today joined the Friendship TrailBrdge supporters in acknowleding that it is not responsible to seek $42 million in public dollars to extend the life of the TrailBridge. SWFBUD will ask the DOT again to see if they retrofit the current westbound bridge with barriers to create a bikeway/walkway. And SWFBUD supports any new bridge to have bicycling and pedestrian areas. Nearly a year ago I had a chance to see the Sea Otter Classic, the country's biggest bicycle festival held in the scenic hills outside Monterey, Calif. It was incredible -- a lively vendor/exhibitor village combined with live bicycle activities of all types. The place was crawling with thousands of bicycle lovers. I loved Sea Otter's synergy of an exhibitor village combined with multiple bicycle activities. So, when Hillsborough County Commissioner Mark Sharpe reached out to me and asked what Hillsborough could do to become known as a bicycle county, I thought, let's move the Bicycle Bash to Flatwoods Park where we can combine a dynamic exhibitor village with off-road, on-road and off-site bicycle activities. So the "2010 Bicycle Bash Classic, Presented by Cure on Wheels" was born. After three successful years of SWFBUD holding the bicycle festival in downtown St. Pete, it was time for SWFBUD to move the Bicycle Bash to a site where we can have BOTH an exhibitor village and many different types of bicycling. 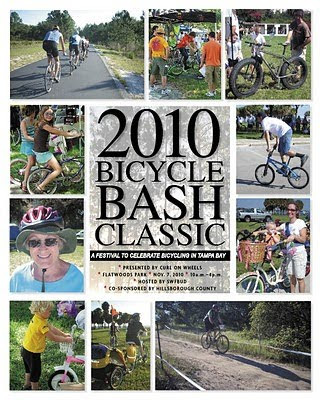 The Tampa Tribune did a story on TBO today about SWFBUD shifting gears and moving the Bicycle Bash to Flatwoods. The story also includes a video SWFBUD made of the 2009 Bicycle Bash. So I'm happy to officially announce the 2010 Bicycle Bash Classic, Presented by Cure on Wheels will be held in Flatwoods park on Nov. 7 from 10 am to 4 pm. The Bicycle Bash will host the Cure on Wheels charity bike ride, which will raise money for local cancer research. Hillsborough County will be a co-sponsor of the Bicycle Bash. For more information, check out the Tampa Bay Sports Commission media release about SWFBUD moving the Bicycle Bash to Flatwoods Park. More news next week about the Bicycle Bash. Stay tuned! This afternoon I rode my bike to enjoy some live entertainment. No, not spring training baseball. I pedaled down Nebraska Avenue four miles to downtown Tampa to watch a bigger circus -- a Hillsborough County Commission meeting where there would be an attempt by a county commissioner or two to fire County Administrator Pat Bean, County Attorney Renee Lee and even an internal auditor amid charges of illegal salary raises, email snooping and an FDLE investigation into county shenanigans. People actually munched popcorn inside the commission meeting room to watch the live theater and there was even a guy holding a Jesus sign on cardboard standing on the side of the meeting room. The guy on the left is munching popcorn while the county commissioners are trying to figure out whether to fire Bean and Lee -- both of whom have lawyered up and had their attorneys in the room. I wish I had popcorn like this guy. I did not have a dog in this hunt. I'm just a former metro newsaper reporter who used to cover contentious and stressful meetings just like these and now I'm a bicycle guy who wants people to ride bikes and works with local governments to enhance bicycling. As a concerned Hillsborough County resident, I have to say it was downright embarrassing to watch seven commissioners try to figure out what to do about Bean and Lee. A majority of commissioners want to can the duo, but the divorce compensation would be $700,000 -- a politically unpopular move. So, the next move was to come up with a good reason -- cause -- to ax the pair. And boy, did the games begin with that one. Hillsborough might be one of the biggest counties in the fourth most populated state in Florida, but this afternoon's commission meeting degenerated into a sniping, theatrical and devisive forum where the commission hired a top-notch labor lawyer at $310 an hour who put in two hours of work right on the spot at the meeting. The lawyer, by the way, is representing USF against ex-football coach Jim Leavitt who sued the college after he got fired by USF. Here's the deal. Commissioner Mark Sharpe wanted to fire Bean and Lee with cause. Commissioner Ken Hagan wanted to fire the duo with or without cause. Commissioner Al Higginbotham wanted to suspend Lee with pay because he says she doesn't treat all the commissioners the same. Sharpe wants the heads of Bean and Lee, especially after Bean gave her top administrators a 1 percent raise without commission approval. Then you have Commissioner Kevin White, who pulled a Bill Clinton and made the romantic moves on young and attractive female aide. White got nailed with a sexual harassment suit -- a drama that has played out the past year. When he said he knew about legal costs during the discussion of hiring an outside lawyer, boy was he not kidding! It also prompted a few cackles of laughter from the audience. Well, White (a black guy) was pissed off at Higginbotham (a white guy) for trying to suspend Lee (a black woman) but not Bean (a white woman). White used the race card during one of his schpiels and an audience validated White's move by uttering, "racism," during the meeting. Here's Lee after the meeting. She had quite a fan club in the audience. Commissioner Rose Ferlita, who will be running for Tampa mayor in 2011, played it safe and wants the $310-per-hour labor lawyer to study the contracts of Bean and Lee. And good ol' boy Jim Norman, a county commissioner who would rather be the sports commish of Hillsborough, also wants to wait until the FDLE investigation is done. And there's Commissioner Kevin Beckner, the ex-cop who was mighty ticked off over the email snooping charges that surround the ongoing FDLE investigation. I walked out of there three hours later feeling pretty sad to be a Hillsborough County resident after watching that performance. March 20: 8:30 AM Garden Center on Central Avenue, Tampa. Seminole Heights Bicycle Club's 22-mile ride. March 20: 10 AM-3 PM Carrollwood Bicycle Emporium. Swap Meet. March 20: 7 PM 1203 East Powhatan Avenue, Tampa. 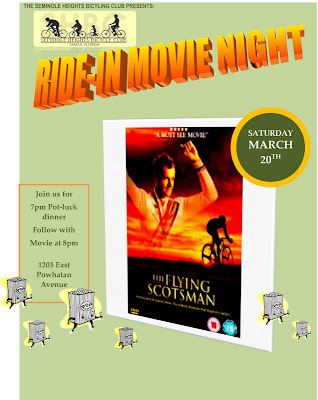 Seminole Heights Bicycle Club's Bike-in Movie Night, showing The Flying Scotsman. March 26: Tampa BayCycle Bike to Work Day in Tampa. March 28: HCC, Plant City. Tampa Bay Freewheelers Strawberry Century Ride. 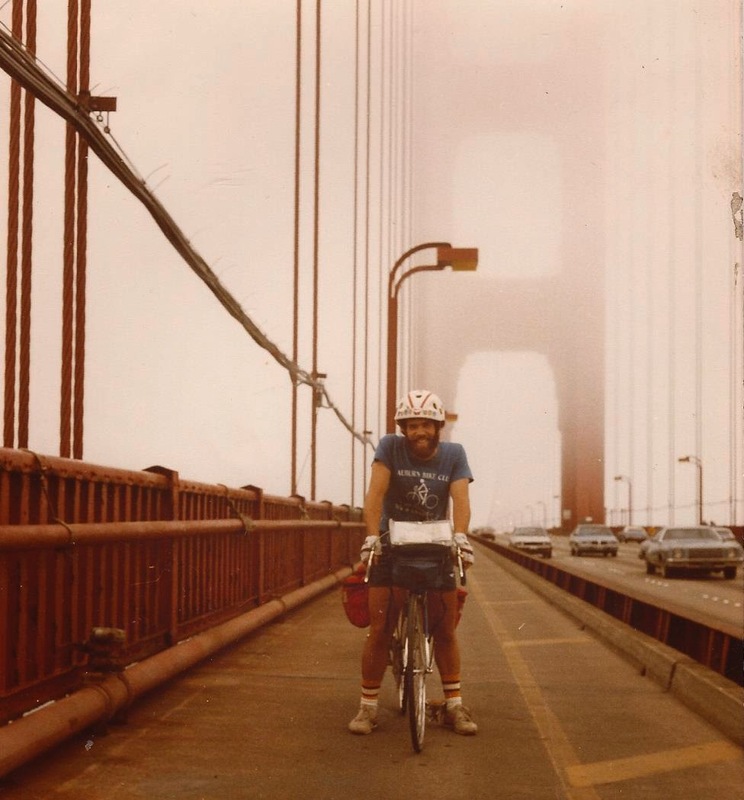 Fascinating read about how bicycling can treat attention disorder. On Tuesday, I snuck in a quick 48-miler to the Philadelphia Phillies spring training stadium where the 2009 NL champs Phillies hosted the Detroit Tigers. I was impressed with the number of bicyclists tho pedaled to the game. There were so many bicycles that there was not enough room at the bike racks for them. In the age of the specialists in baseball -- long reliever, short reliever, fat reliever -- there's also a new job. Here are two foul ball catchers who work outside the ballpark to catch foul balls that leave the park stadium. I followed the Clearwater east-west trail to Safety Harbor and Oldsmar, where I picked up Hillsborough Aveue for the ride back to Seminole Heights. Looks like the emails sent to the Florida Senate committee that was considering cutting the Florida Office of Greenways and Trails worked today. "Thank you for your email regarding the Office of Greenway and Trails. I support fully funding this program and I am actively working to avoid this merger. I am proud to tell you it appears we have now saved full funding except for the elimination of two already vacant positions. I will continue to work on this issue, also, to assure that it remains funded. By Charlie, I'm assuming state Sen. Charlie Dean. Nice work everyone who contacted the state senators on this committee. Last week, in Washington, D.C., the U.S. Transportation Secretary voices his support for bicycling. This week, here in Florida, members of the Senate General Government Appropriations Committee will be chatting about the elimination of the Office of Greenways and Trails. I am writing to urge you to reject a proposal to eliminate the Office of Greenways and Trails and merge its functions with the state park system. The elimination of the 16 positions that run the Greenways and Trails program would essentially kill one of the shining stars of Florida's recreation and tourism businesses, all to save $1 million. The Greenways and Trails system receives 4 million visitors a year in Florida and has an economic impact of $95 million a year. This program cannot run without a staff and this small investment is yielding strong returns on our investment. Just as the country is focused on alternative forms of transportation and on more healthy lifestyles to fight obesity, Florida would be eliminating one of its most successful programs to make progress on both those fronts. The residents and visitors of Florida consider the greenways and trails important to the quality of life here and what brings visitors back each year. I urge you to make smart economic decisions when you make budget cuts, and this proposal is not one of them. This office actually brings in revenues to the state. Not only would this proposal shoot Florida in the foot economically but it would make Florida's bicycle and pedestrian safety situation even worse. From 2001 to 2008, the last year recorded, Florida has either been #1 or in the top 3 in the nation, in both bicycle and pedestrian fatalities. 1 out of 10 pedestrian fatalities occurs in Florida. 1 out of 6 bicycle fatalities occurs in Florida. Florida needs safe places to walk and ride a bicycle. I have fond memories of last week's National Bike Summit, which offered this very cool video. Also, the U.S. Secretary of Transportation Ray LaHood announced last week his support for bicycling. "Today, I want to announce a sea change. People across America who value bicycling should have a voice when it comes to transportation planning. This is the end of favoring motorized transportation at the expense of non-motorized. We are integrating the needs of bicyclists in federally-funded road projects. We are discouraging transportation investments that negatively affect cyclists and pedestrians. And we are encouraging investments that go beyond the minimum requirements and provide facilities for bicyclists and pedestrians of all ages and abilities." You should consider attending next year's Bike Summit. Here's 10 reasons why. No wonder the Squiggy was postponed this past weekend. Much of the land around Flatwoods County Park was under water. True the area is a flood plain, but this unusual wet winter has left more water around the park than anyone can remember. I made it through Clay Gully today, but another bicyclist turned around. It's going to be a while we can bike on the trail along here. Good thing for the bridge, though there was some water waiting for you on the other side of the bridge. Look who is biking a new recumbent. Free Lightning Ticket For Biking To The Game, Eh? How About This Billboard In Tampa Bay?